It’s easy to forget how much we depend on our hands until we are unable to use one of them. Knitting and crocheting enthusiasts might feel that that the inability to use one hand means they must forsake a beloved hobby, but it doesn't. 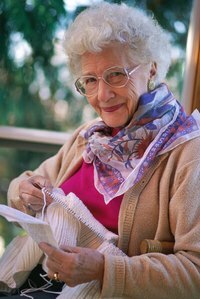 It does mean, however, investigating various techniques for one-handed knitting and crocheting. Adjustable table clamps to hold your crochet hooks are available and, in the case of knitting, a circular or rectangular knitting loom is an alternative to knitting with needles. Fasten a slip knot around the first peg. Position the loom so that the first peg is at the top, in a 12 o’clock position. Wrap the yarn around the peg to the right of the first one, taking the yarn counter clockwise all way around the peg. Take the yarn to the next peg on the right and wrap the yarn around it in the same way. Keep going until you have wrapped all the pegs on your loom. Push the loops about halfway down their pegs to give you room to work. Wrap the yarn around the loops again. From this point you will need to hold the loom in place while you work with the crochet hook, so secure the loom with a clamp attached to your table or work surface. Take your hook and pull the bottom loop over the top loop and off the first peg. Do this for every peg. Continue to wrap the yarn around the pegs again and pull the bottom loop over the top loop and off the peg to produce rows of knitting. A popular loom project for beginners is a simple tube scarf. The bigger your loom, the wider your scarf will be. Keep knitting rows until your scarf is the length you want. Bind off by using the crochet hook to remove the loop from the peg to the left of your final stitch. Hook the loop from the peg on the left of that and pull it through the first loop on your hook. Keep hooking each successive loop and pulling it through the previous stitch until you have just one final loop on your hook. Cut your yarn to leave a piece about 2 inches long. Pull it through the final loop to fasten off your work. Use the clamp to secure the crochet hook so that it is positioned where you would hold the hook in your dominant hand. Even if you have the use of your dominant hand, it will be doing the work of your other hand and you will probably still find it easier to adjust to this setup if you have your work in the usual position. Make a slip knot with the yarn. Attach it to the crochet hook and tighten it to make the first loop of your crochet chain. Loop the yarn over the crochet hook, as you would for ordinary crocheting. Take the loop that is already on the hook and pull it over the new loop, using the hook to keep the new loop in place. Continue making loops and pulling the previous loop over the new one until the chain you have crocheted is the length you require. Build on this chain to create a crocheted piece. You can crochet to any length you need and use any kind of stitch you want, but you will be pulling the loop that is on the hook off and over the new loop, rather than moving the hook to pull the new loop through the previous one. Do not wrap the yarn too tightly on a knitting loom as that will make it difficult to pull loops with the hook. Buy a knitting tool designed for use with a loom. You might prefer to use this instead of a crochet hook for loom work. Crocheting with one hand takes practice, especially when it comes to getting the tension right. Using large hooks can be easier while you are learning. Remember that knitting machines offer an alternative way of creating knitted items.